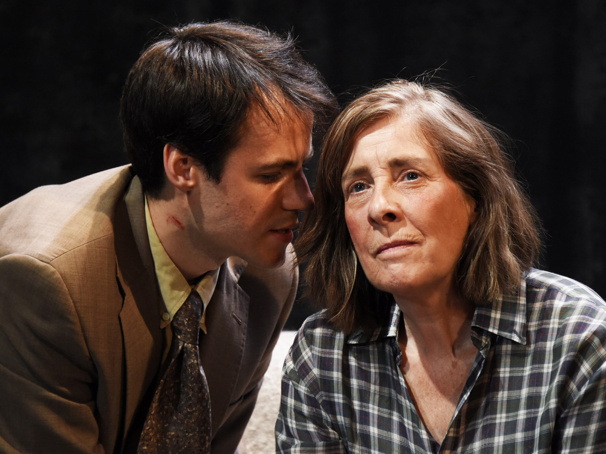 Calum Finlay & Phyllis Logan in "Switzerland"
Joanna Murray-Smith's acclaimed psychological thriller Switzerland, about the life of late author Patricia Highsmith, will soon move to London's Ambassador Theatre. The transfer from a sold-out run at Theatre Royal Bath will begin West End performances on November 10 with an opening set for November 19. Lucy Bailey will repeat her work as director, with Phyllis Logan and Calum Finlay reprising their celebrated performances as Highsmith and Edward Ridgeway, respectively. Switzerland paints a portrait of Highsmith, one of the great writers of the 20th century, who is best known for writing The Talented Mr. Ripley, Strangers on a Train and The Price of Salt. The play originally premiered in Australia in 2015 where it won Best New Australian Work at the Sydney Theatre Awards. Phyllis Logan is famed for her turn as Mrs. Hughes in ITV's Downton Abbey and as Lady Jane Felsham in Lovejoy. Her theater credits include Richard III (Crucible Theatre), The Case of David Anderson Q.C. (Traverse Theatre) and Marvin's Room (Hampstead Theatre). Calum Finlay recently appeared onstage in Mary Stuart and Hamlet (Almeida/West End). He has performed regularly with the Royal Shakespeare Company in The Merry Wives of Windsor, Macbeth, The Mouse and His Child and Jubilee. Switzerland will play a limited West End engagement through January 5, 2019.